Harry Washburn wass one of those rare people who saw the big picture and the crucial details. With that combination, he was both an inspirational executive and an outstanding engineer. As president of The North American Coal Corporation, Mr. Washburn saw and acted on new opportunities, leading the company’s successful transformation from an Eastern underground mining company to a Western surface mining company. His influence remained strong throughout his career. Mr. Washburn was always ready to serve and lead. Following graduation from Paducah Tilghman High School, he was in the Army Air Corps for five years, serving in England, Africa, Sicily, Italy and Corsica during World War II. One year after his discharge, he enrolled in the University of Kentucky College of Engineering. He was a member of Tau Beta Pi, the Engineering Student Council and the geology and research honorary societies. He won the Outstanding Senior Award and the coveted Old Timers Club award, given to the outstanding mining engineering student. He earned a Bachelor of Science degree in 1950. Mr. Washburn was one of many students assisted by Samuel M. Cassidy, Jr., a UK engineering graduate who was president of Consolidation Coal Company of Jenkins, Kentucky. Mr. Cassidy arranged for Mr. Washburn to work with a coal coke plant in Buffalo, testing the ability of several seams of coal from Eastern Kentucky to form coke, a fuel and chemical reducing agent used in the production of steel. Bethlehem Steel purchased the reserves from Consolidation Coal, and Mr. Washburn was permitted to use results of the test for his Master’s thesis. He received his Master of Science in mining engineering in 1951. He joined Consolidation Coal as a project engineer, and soon made significant contributions. He produced valuable new knowledge on an ongoing industry issue – the spontaneous combustion of coal stored on docks. He was involved in the industry’s first attempt to transport coal through a surface pipeline. That successful project resulted in the construction of a 110-mile pipeline from mines in southern Ohio to power plants near Cleveland. His next experience taught him what he called the “art” of mining engineering. That’s how he described learning every aspect of the preparation and mining process as he served as preparation engineer and chief engineer of Consolidation’s Mountaineer Division in West Virginia. He was in charge of the design and construction of one large mine and two preparation plants. The preparation plants removed the extraneous material from coal so that it burned more efficiently. 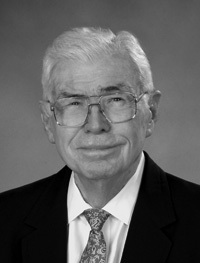 His knowledge and leadership skills led to an opportunity to join North American Coal Corporation in Cleveland as assistant vice president in 1966. North American is involved in the acquisition, mining and marketing of coal used by electric utilities. His responsibilities continued to increase. He was promoted to vice president of engineering, and then senior vice president of operations. In 1981, he was named president of North American. It was, in his words, “an exciting time.” The company had operations in Pennsylvania, Ohio, Texas, North Dakota and Utah, with exploration throughout the West and Southwest. During his tenure, the company was the country’s seventh largest coal producer, with 20 to 25 million tons produced each year. North American employed more than 7,000 people, and had 15 operational mines organized into three divisions. Mines that opened in North Dakota won safety awards from the Mining Safety and Health Administration in every year of his presidency. Mr. Washburn was a leader in the transition from conventional and continuous mining methods to the utilization of sophisticated longwall equipment. One colleague called the evolution from hand loading, conventional, continuous to longwall mining “as dramatic as moving from medieval times to the 21st century.” He shared his knowledge with others through articles in professional journals on mining costs, operations and technical issues. His success was due not only to technical and business knowledge. Colleagues were quick to credit his leadership style, saying he was fair to employees and customers, and always upheld the highest professional standards. Mr. Washburn took great pride in creating new jobs for employees at every level. Mr. Washburn died June 26, 2013. His wife, Gay, has also since passed away. They are survived by two daughters.